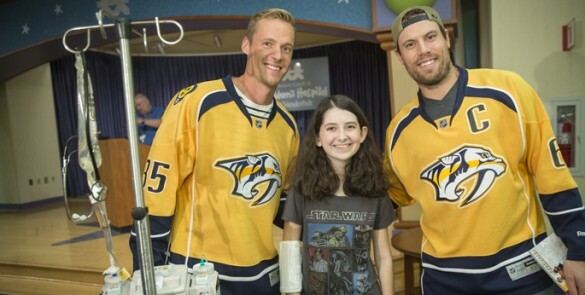 Nashville Predators captain Shea Weber and goaltender Pekka Rinne, along with Predators leaders and mascot Gnash, recently presented the proceeds of the team’s 365 Pediatric Cancer Fund to Monroe Carell Jr. Children’s Hospital at Vanderbilt. Building on last year’s success, the latest donation was the largest single donation the Predators have made to Children’s Hospital. Weber and Rinne presented hospital leadership with a check for $395,424. Of that amount, $100,000 will go toward the Growing to New Heights Campaign for the hospital’s upcoming four-floor expansion. Over the past six years, the team has donated more than $1 million to the hospital and its programs. “The Predators have been great community partners, and we are thankful for the support they have provided to us over the years to help fund cancer research,” said Meg Rush, M.D., chief of staff and executive medical director at Children’s Hospital. The Predators renamed its annual fundraiser two years ago the 365 Pediatric Cancer Fund, presented by Dollar General, with Weber and Rinne spearheading the generosity. Beyond the fundraising efforts, the Predators players donate a lot of their time to visit with patients in the hospital. “The success of the 365 Pediatric Cancer Fund would not be possible without the selfless generosity exhibited by Pekka and Shea,” said Nashville Predators President/COO Sean Henry. Money for the 365 Fund is raised during Hockey Fights Cancer games, silent and blind auctions, mystery pucks and fan donations. The next Hockey Fights Cancer night is Saturday, Nov. 7.